Use the following snippet to display the URL of a custom post types taxonomy term. Just replace the word position with the name of the taxonomy. Place it into the wp-includes directory on your server. Be careful not to place it into your site's root directory (or your WP install directory). There should be .htaccess files in both ("both" - in case your root directory and your wp install directory is not the same - probably the same though) and they contain important lines for your wp setup. If you override those files, your wp site might not work at all but in the least you get it deindexed. We all know that tags are a vital part of WordPress taxonomies, which are a way of grouping things together. Tags are created on the fly while creating posts and help us to locate similar posts linked by particular tags. 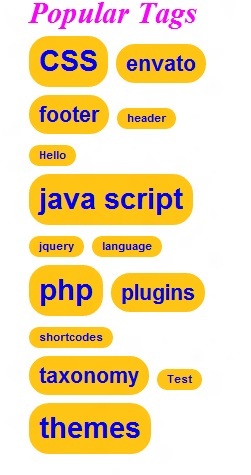 Generally in a WordPress blog, different tags are grouped inside a tag cloud, and the size of each tag determines the frequency of its assignments to posts. Here we shall look into the correct usage of the wp_tag_cloud() function, which is responsible for all these tag clouds. This is the main built-in function to display the tags associated with your recent posts, within the tag cloud. The WordPress Codex wp_tag_cloud() page has a clear explanation of all the parameters of this function, but still let's quickly discuss the important ones. These parameters play a key role in customizing the tag cloud. WordPress has a default Tag Cloud widget which can be placed in the appropriate area of the page. 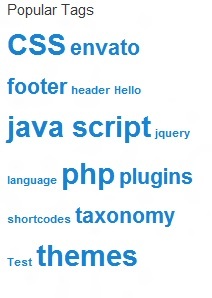 But without using a widget you can use the wp_tag_cloud() function to display and customize the tag cloud in your blog. You can specify the parameters in a number of ways. Parameters separated by '&' in one simple inline string. Parameter specification in array format. Specifying only selected parameters, the rest are kept as default. Return the tag cloud as an array without displaying it in the blog. This result can be used later within the PHP code. Create a function in your functions.php file and return the wp_tag_cloud() function. Once it is defined, you can call the function anywhere within your blog. Now let us open our sidebar.php and call the function to display the tag cloud. 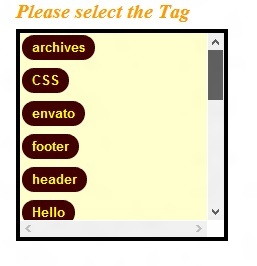 Let's add some CSS styling in our style.css file to make the tag cloud look more professional. Similarly using the same in the footer.php of our theme. You can make it more beautiful by adding your custom CSS styles. Sometimes you do not like to keep the tag cloud in your sidebar or footer and creating a separate page for it keeps your blog clean. You can do so using the following method. At first create a custom page template in your theme folder with the wp_tag_cloud() function. Here we have named the file tagcloud.php. Now log in to your WordPress admin and go to Pages -> Add New. Put a good title for the page and then under the Page Attributes section choose the Template as Tag Cloud and then click on Update. That's it; your tag cloud page is ready. You can style the page with your own CSS styles. Sometimes we want our users to select tags from a scrollable box in our sidebar. To accomplish this we have to create a function in our functions.php file. In the above function we have considered the array format of the wp_tag_cloud() function, along with that the font size has been kept the same and the list has been ordered by name in ascending order. Now open your sidebar.php and call this function. Let us style it with some CSS. Thanks for reading and please feel free to suggest some more uses of this very useful wp_tag_cloud() function. Here's a handy conditional snippet to target specific archive or single pages from a custom post type. Recently I needed a wordpress plugin that allowed me to import a CSV file and store the data into a SQL table. Not knowing any particular plugins I decided to to download, install and test a whole bunch of them - and the results, whilst not always providing a solution to my original problem where still very interesting. A very simple plugin that efficiently imports data from a CSV file and matches it against a variety of post/page related fields. I can see that this plugin would be extremely helpfull for creating pages or posts from a spreadsheet of data. I can already forsee a potential use for this plugin in an upcoming project where I need to migrate much content from static HTML website into a wordpress site. Another great content importer that matches the CSV data to a variety of wordpess fields. This plugin is very simple to use, and has a number of advanced features in the free version such as the ability to not only map the content to a wordpress post or page, but also a user, taxonomy, or custom post type. The premium version of this plugin allows automated scheduled importing. Need to insert a table into your page or post? WordPress Tables plugin will take your data in CSV/JSON format or directly from MySQL table and create an interactive data table. With WPTables plugin, you can easily create and manage your tables from the WordPress administration. Simply insert a shortcode into your page, article or post, and you are ready to go. That’s it! Enjoy your new table. I've recently needed to modify the wordpress menu code so that I could insert bootstrap classes directly into it. Make sure to replace the menu slug. To do this make sure the menu is assigned to a location on Wordpress. The menu slug is infact the location using lowercase and dashes (for example: footer-menu). The following solutions pertain to the excellent wordpress plug Advanced Custom Fields. More info here - and here's how to do it inside the loop. This is a super handy snippet that will display a specific pages content. It's very usefull to display content in a module or widget area outside of the main content area.